As the spring sunshine starts to warm up London, music fans and vinyl enthusiasts alike start to get amped up to celebrate Record Store Day! With exclusive releases available and many exciting activities happening, it’s a great opportunity to visit and support your local record shop. We returned once again to London’s historic Berwick Street, home to some of the city’s best record shops where we joined up with the Richer Sounds pop-up shop and market stall, handing out coveted Richer Sounds goodie bags filled to the brim with special treats. As the festivities on Berwick Street wound down, we made our way over to the beautiful St. Pancras New Church to get things ready before the curtains went up on our exclusive money-can’t-buy event with Newton Faulkner to celebrate the release of our third ‘Best of Unsigned’ vinyl. 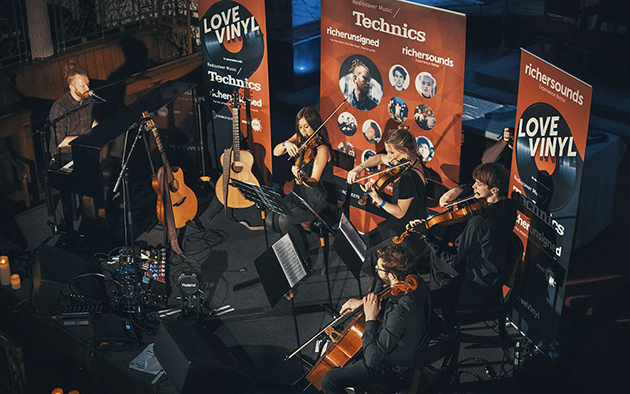 Starting off the night was a lineup of fantastic artists appearing on the Richer Unsigned Best of Unsigned vinyl, who were selected by Newton himself as support. For those who may not be aware, Richer Unsigned was created by Julian Richer, Founder of Richer Sounds, as a way to give back to back to musicians. Richer Unsigned is strictly not-for-profit and champions ALL musicians; those who may be just getting started, who have been in the industry a while or simply don’t have a great label deal. As long as the music is great, they do all they can to get talent heard! First to the stage was Ben Pavely, a singer-songwriter originally from the West Midlands. Now based in Liverpool, the 23 year old artist has managed to achieve a lot in a short space of time. Playing shows all around the country with the likes of Lucy Rose, Frances and many others. Being compared to artists such as Ben Howard and Matt Corby, it’s easy to see why his music has captured the attention of audiences everywhere. His song “I Tried” features on the ‘Best of Unisgned’. Next up was Alex Bloom, all the way from Los Angeles! Subtle traces of his biggest influences from a forgotten era can be heard in his use of harmony and melody, but his unique sense of songwriting is entirely his own. At just 24, Bloom harnesses deeply personal and emotional topics in his songwriting as though he’s spilling his guts right to you. Rounding out the support acts was Amaroun, the latest project from London-based British-Caribbean artist Jay Brown, existing at the sonic crossroads where Erykah Badu, Eels, PJ Harvey and Feist meet. Songs about coming out, moving up and not being kept down, Amaroun creates a truly unique form of kaleidoscopic pop music for the 21st century. While Amaroun often performs as a larger band, we were treated to a beautifully stripped back performance, highlighted wonderfully in “Bed Bugs”, the song that appears on the record. After a brief intermission, it was time for the main event! Our good friend Newton Faulkner took to the stage, and after a brief check in with the audience, he proceeded to show us a level of showmanship and musicianship that only comes from years of performing. His first few songs were performed solo (and for the first time in shoes, according to Newton), showcasing his unique playing style of using the guitar as a percussive instrument as well as a melodic one. Then, as an incredibly special treat, Newton was joined on stage by a string quartet to perform a handful of songs in a piano and strings arrangement, which was made all the more stunning working with the natural acoustics of the church. After the quartet made a speedy exit, Newton treated us to a few more numbers, completely bringing down the house and receiving a well-deserved standing ovation, capping off an amazing night of full of beautiful music. We wish to say a huge thank you to all the staff and volunteers who helped make this event happen, the talented Unsigned artists, and a very special thank you to Newton Faulkner for a truly unforgettable evening of music.